Coptotermes acinaciformis is a native Australian species of subterranean termite. This destructive species resembles a white ant, but is slightly larger in size – approximately 5-7mm in length. Like ants, subterranean termites colonies consist of several different castes. Workers are entirely white in colour and have no eyes. Soldiers are also eyeless but have brown heads and large jaws. Soldiers are aggressive in nature and they may make a loud ticking sound when disturbed. In summertime, there is also a winged form of Coptotermes acinaciformis known as alates. Alates are larger at around 12mm long. They are brown, with compound eyes and have four wings of equal size. The lifecycle of Coptotermes acinaciformis begins when male and female members of the winged reproductive caste (or alates) are released from an established nest. Pairs will mate and start seeking a location to start a new colony. The release of winged reproductives occurs annually and they leave the nest in great numbers, but lots will not survive long enough to be successful. Once a suitable location has been found, the female or ‘queen’ lays eggs, which then hatch into nymphs. The nymph will then moult approximately 4 – 7 times over a period of 2-3 months before maturing into a worker, soldier or winged reproductive. The lifespan of a soldier or worker is typically 2 – 3 years. Coptotermes acinaciformis will typically build their nest underground, under patios, below concrete slabs & flooring or in the base of a tree trunk. They especially favor certain trees. Subterranean termites require close contact with soil or moisture and a tree-dwelling colony will construct a mud pack above the nest. Like all termites, Coptotermes acinaciformis feeds on cellulose, which can be found in timber framing in homes and buildings including plants, trees and logs. They forage for food constantly and will travel as far as 50 metres from the nest. They tend to stay out of the light and will pack mud around the feeding area to maintain a dark and moist environment. Wood used as a food source for Coptotermes acinaciformis will have a honeycomb texture and contain dirt and faeces. 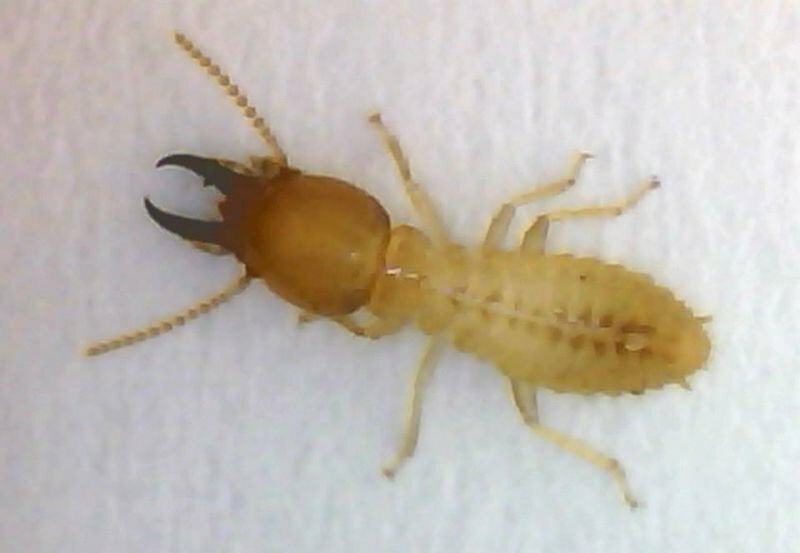 Coptotermes acinaciformis is widely distributed across Australia and because of this is classed as the nation’s most destructive termite species. They are potentially a threat to any timber structure most commonly houses. For the best in pest control and termite treatment solutions, contact Pest Ex today.